Ecobee currently has two smart thermostat models available in the market – Ecobee 4 and Ecobee 3 Lite. Out of these two models, Ecobee 4 is the full-featured model with lots of features like , built in Amazon Alexa, and a lot of useful features. Ecobee 3 Lite is the budget model smart thermostat (a trimmed version of Ecobee 4 in features) which has all essential features needed for a smart thermostat but not as good as Ecobee 4.In this guide, we review Ecobee smart thermostats and compare Ecobee3 Lite vs Ecobee4 – two best selling thermostat models from Ecobee. Ecobee3 Lite and Ecobee4 integrate well with Amazon Alexa, Apple HomeKit, Google Assistant, Samsung SmartThings, Microsoft’s Cortana, and other home automation hubs. Ecobee thermostats can be controlled using the touchscreen (available on thermostat) or your smart phones/tablets from anywhere in the world. They also help to set reminders for HVAC maintenance, UV lamp or furnace filter replacement, alerts for low/ high temperature or humidity. They offer you a feeling of comfort in no time. The prime difference is Ecobee 4 has built in Amazon Alexa & comes with a room sensor (1 room sensor included); where as Ecobee 3 Lite has no built in Amazon Alexa & no room sensor provided with the product (you’ve to buy room sensors & Alexa device separately). See our comparison Ecobee3 Lite vs Ecobee4 for more differences! Before buying an Ecobee Thermostat, you’ve to first check if the model in your mind (Ecobee 4 or Ecobee 3 Lite) is compatible with the current heating/cooling system in your home. We are listing out a few important points to check & verify. #1 – Line Voltage or Low Voltage – identify if your heating/cooling system is line voltage or low voltage. Ecobee thermostats (both models) are designed for low voltage systems only. They work well with 24V HVAC systems like central furnace, boilers, heat pumps etc. You should not buy an Ecobee model, if you’ve line voltage systems like Baseboard heaters, forced fan heaters as your heating source. #2 – Stages of Heating/Cooling systems – Conventional HAVC systems (like a central furnace) are either single stage or multi stage. Ecobee thermostats (Ecobee 4 & Ecobee 3 Lite) support both single stage and multi stage systems. In the case of a multi stage HVAC system, they support 2H/2C – which means 2 stages of heating & 2 stages of cooling. #3 – Heat pumps – Ecobee thermostats support all heat pump models including heat pumps with auxiliary/emergency heating. Ecobee 4 supports heat pumps (4H/2C – 4 heating stages & 2 cooling stages) and for heat pumps with aux heating (2H – 2 stages auxiliary heating). Take note Ecobee 3 Lite supports only 2H/2C (2 stages of heating & cooling, marked as Y1 and Y2) of heat pumps and 2H (2 aux heating stages, marked W1 and W2) of Heat pumps with aux/emergency heating. Note: In case of auxiliary heating, both Ecobee models support gas, oil, electric or dual fuel sources. #4 – Boilers – Both models support 2H/2C (2 stages of heating W1 and W2) in the case of boilers. For cooling, they support 2 stages of forced air cooling (known as 2 transformer configuration). #5 – Accessories – Ecobee 4 supports all types of accessories like humidifiers, dehumidifiers, ventilators (ERV & HRV). Ecobee 4 comes with terminals for connecting accessories. Pleas note Ecobee 3 Lite does not support any accessories and there are no terminals provided on Ecobee 3 Lite to support accessories. #Final – Use the compatibility checker tool provided in Ecobee website and see if your system is compatible. Ecobee4 – is the fourth generation smart thermostat from Ecobee, with built in voice control feature. The Amazon’s Alexa is built into Ecobee4 – which means just talking to the device from anywhere inside your home (the microphone has high sensitivity that Ecobee4 will capture your voice even across the room) is all you need to do to control – like setting the timer, or turning it OFF or whatever! . The highlight feature of an Ecobee thermostat is energy savings! Ecobee claims to save on average 23% of energy utilization every year.Obviously the company might have tested this on ideal conditions (without extreme temperature variations) but I think its great if you get anywhere near 20% and that’s considerable savings of money. You can get the money invested in an Ecobee thermostat back in just 2 or 3 years with this kind of energy savings. Ecobee4 works on real time when connected to the internet. Both models (Ecobee 4 and Ecobee 3 Lite) comes with a mobile app which you can install in your smartphones to control the device from anywhere (anywhere in the world provided your thermostat is connected to internet). Ecobee4 comes with an extra room sensor (only 1 sensor provided) which helps you to manage hot/cold spots. You can install this room sensor in a favorite room of yours (possible your master bed room) and this sensor will help to eliminate any hot/cold spots in this room. Usually thermostats (which has built in sensors) are installed in the common living room and it wont sense temperature/humidity level in other rooms leading to uneven temperature in some areas. This extra sensor solves this pain point. Additional Sensors: If you need extra sensors, you can purchase a couple from Ecobee separately and pair them with your thermostat. # Built in Alexa: – This makes Ecobee4 more than a simple smart thermostat. All you need to do is just talk to your new friend, Ecobee4. Accordingly it sets the temperature, timers, alerts and reminders. The best thing here is you can avail all features of Alexa along with the thermostat, like you can integrate it with almost all your home appliances and control them. The integrated alexa can also read news, make changes in temperature, turn on/off the lights, play music, book uber etc. # Design: – Ecobee4 has a beautiful design with a classic touchscreen that displays the mode, humidity level of indoors, current temperature settings and various updates and alerts. There is a blue LED line at the top which indicates when Alexa responds to your queries. The product dimension is 1x4x4 inches. # Ease of installation: – While most other smart thermostat models take up to 40 minutes to install, the Ecobee4 takes less than 15 minutes as it comes with a built in leveler making it ready to install. # No Need of C-wire – If your home doesn’t have a C wire, installation can take a little longer because you need to install the included Power Extender Kit. It works with nearly every kind of HVAC system (except baseboard heaters/line voltage systems) and there is a detailed walkthrough in the manual that comes along with it. Read the compatibility guide we have presented above. Note: If you don’t know which is your current thermostat or which is your present heating/cooling system, read our guide to – Identify your heating/cooling system. # Far field technology: – This feature enables you to talk to the thermostat from anywhere across the room. As I wrote before, Ecobee 4 has a powerful microphone which fetches voice commands from far away places (than where the thermostat is installed. # Sensing and operating: – These smart thermostats save energy by learning your habits and thereby adjusting to maximize your comfort (and max energy savings). # Geofencing: – This feature tracks the location of the owner and the thermostat automatically acts to make the temperature at the most comfortable level when owner arrives home. Ecobee4 is truly a smart thermostat with Alexa built in making the interaction as interesting as talking to your friend. A true friend to your smart home, with the ability to control everything from its voice activated assistance. If you wish to own a fully featured, truly smart thermostat – go for Ecobee 4 without second thoughts! You’ll be rewarded in the long run! On the other side, if you don’t have that high budget and still wish to own a smart thermostat – go for Ecobee 3 Lite. Read the full review given below. As I already wrote before, Ecobee 3 Lite is a budget model smart thermostat from Ecobee. This model is basically a trimmed down version (in features) of Ecobee 4. The prime difference is Amazon Alexa and enclosed room sensors – where Ecobee 3 Lite doesn’t have a built in Alexa feature and no room sensor is enclosed with the package. You’ve to buy both separately! The good side is compatibility – Ecobee 3 Lite is compatible with Amazon Alexa & extra room sensors can be interfaced if you really want them later. Self Learning – Just like Ecobee 4 , this model is ‘self learning‘ and programs itself after analyzing your living habits and patterns. Budget Model (lower price) – when compared with Ecobee 4 -the full featured model. Monthly Energy Reports can be obtained to study about the device’s performance and even gives you tips to improve savings. Smart Hub Integrations – with IFTTT, Amazon Alexa, Echo, Echo Dot, Apple HomeKit, Wink and SmartThings. Smart Recovery – feature can track your local weather throughout the day with the help of internet and heats/cools your home accordingly. Easy to use and has a very fast responsive touchscreen. Vacation mode can be activated when you are away from home for an extended period of time. Alerts and reminders help you by notifying at the correct time when something goes wrong. Effortless control at your finger tip as you can adjust the temperature and comfort settings from anywhere around the world using your android and iOS devices including apple watches. Lacks Geofencing – which is a feature that detects if you’re away or nearing home from work. When you are near your home, this feature will turn the heating system ON and preheats your home to a comfortable level before you reach home. Lacks accessory terminals – required to control HVAC accessories such as humidifiers, dehumidifiers and ventilators. The prime difference between Ecobee3 Lite vs Ecobee4 – is that Ecobee3 Lite is a budget model smart thermostat, whereas Ecobee4 is a full featured smart thermostat. Ecobee4 comes with builtin Amazon Alexa and an extra room sensor, but you’ve to purchase them separately (if you really need) for Ecobee3 Lite. Another noticeable difference is the proximity sensor and geo-fencing feature present in Ecobee4 but lacking in Ecobee3 Lite. Well, these are some important differences between Ecobee3 Lite and Ecobee4. Let’s see a detailed comparison between Ecobee3 Lite and Ecobee4 below. Note: #HVAC Accessories – Another important difference to note is about “hvac accessories”. Ecobee4 supports hvac accessories like humdifiers, dehumidifiers, and ventilators (ERV, HRV). Ecobee3 Lite does not support any kind of hvac accessories. # Design – If you just glance, both Ecobee3 Lite and Ecobee4 would look same to your eyes. But Ecobee4 has a glowing LED bar on top, which shines when Alexa is activated. The dimensions are almost same for both, but Ecobee3 lite is smaller in size (4 inch length, 4 inch width and 0.8 inch thickness) and Ecobee4 is bigger comparatively (4.29 inch length, 4.29 inch width and 1 inch thickness). # User Interface – Ecobee4 and Ecobee3 Lite comes with a 3.5 inch touch screen (full color), built on 320×480 resolution. Both models display current temperature, humidity, status (off, heat, cool), alerts, and features for various manual adjustments. Ecobee4 has a button to activate Alexa manually. The web/mobile app interfaces are same for both models. # Integrations – All Ecobee models are third party integration friendly. Ecobee4 has built in Alexa making it smartest of all thermostats. You need to buy Amazon Echo or Echo Dot separately to pair it with Ecobee3 or Lite versions. Ecobee4 eliminates the need for this separate purchase as it has Alexa built into it. Except for this all Ecobeessynchronise perfectly with IFTTT, wink, smartThings and Apple HomeKit. # Operating patterns and sensing – They save upto 23% of energy by learning habits and routines and there by maximizing your comfort. Ecobee4 have room sensors to attain better control. Unlike Ecobee4, Ecobee3 doesnot support geofencing which helps to automatically track you and make your home comfortable when you reach near. Ecobee4’s mobile app has geofencing feature. All Ecobee thermostats can check and change temperature of your HVAC using mobile application or through web. From the above observations it is clear that Ecobee4 version is the smartest. So if you have enough budget, then go for it without second thought. The smarter ones for a smarter home. 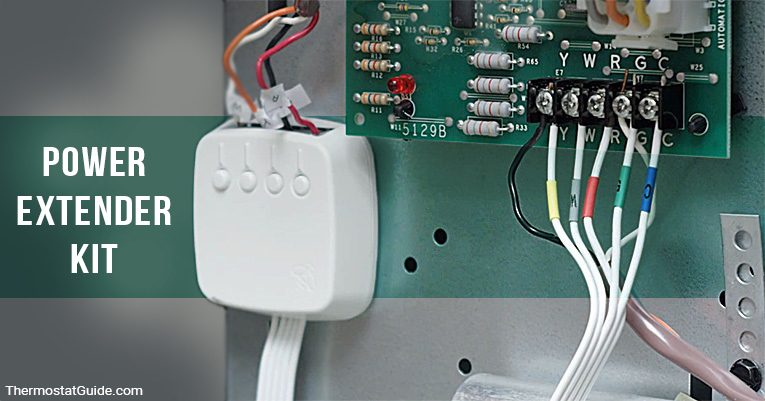 Most of the smart/WiFi thermostat models (like Nest, or Sensi ST75 or Honeywell RTH9585) require a C wire or common wire in your home electrical circuit. Ecobee thermostats also works well with a C-wire connection. But if you don’t have a C-wire or common wire in your home electrical circuit, dont worry! Ecobee has a workaround for homes that don’t have a C wire. Ecobee thermostats (Ecobee3 Lite and Ecobee4) ships with a PEK (Power Extender Kit) – which is for homes without a C wire. You’ll need to connect the PEK to the control board of your HVAC system (a furnace or heat pump only). Once the PEK is connected properly, you’ll need to wire the Ecobee thermostat according to the instructions given for installation with a PEK. You may check the installation steps of Ecobee to get a detailed idea. The take away here is, you can buy an Ecobee thermostat without worrying about the C wire/common wire in your home. Both Ecobee thermostat models (Ecobee3 Lite and Ecobee4) can be installed irrespective of your home having a C wire or not. Ecobee thermostats are undoubtedly the best in smart thermostat category, and they stand at par with Nest by all standards. If we compare Ecobee 4 vs Nest 3rd Generation, I would give some extra points to Ecobee 4 as it ships with a remote room sensor (and an option to add more remote sensors as required). Remote room sensors helps to manage uneven heating (hot/cold spots) in some zones or areas. If you don’t prefer remote sensors, then Ecobee 4 & Nest 3rd Gen stand equal in many important parameters. However, recall that Nest has “self learning” feature and it programs itself; whereas Ecobee thermostats are not “self learning” and you’ll have to program the thermostat or use a preset schedule. Ecobee claims 23% annual energy savings on heating bills, whereas Nest claims 13 to 15% annual energy savings on heating bills. These savings rates are manufacturer claims and may not reflect actual savings when you install them. Note: At the time of publishing this review, extra temperature sensors (room sensors) were not available for Nest thermostats. But recently Nest has introduced additional room temperature sensors to manage hot/cold spots. These room sensors can be interfaced with Nest 3rd Gen or Nest E model. However, you’ll have to purchase this sensor separately for both Nest thermostat models. The budget models of Ecobee & Nest – Ecobee 3 Lite and Nest E are also comparable by all standards. So when it comes to choosing Nest or Ecobee, its more of a personal choice than judging by features. However there are compatibility differences (for different HVAC systems), so you may ensure your choice is compatible with your system. We at ThermostatGuide, aims to help you choose the right thermostat. We’ve covered every detail about the two Ecobee smart thermostat models – Ecobee4 and Ecobee 3 Lite. 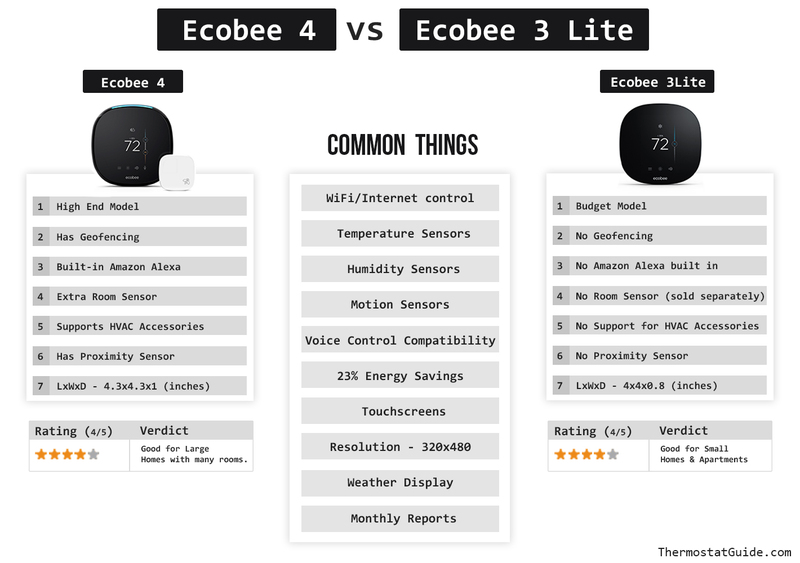 We’ve also compared Ecobee3 Lite vs Ecobee4, taking almost every detail into account. We hope, you’d have made your mind now. Single Stage vs Multi Stage Heating/Cooling Systems – Which one is Yours?